He knows just what to say to calm you down if you're freaking out. 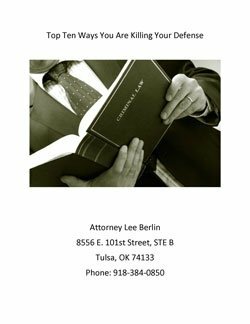 Lee Berlin is seriously the best attorney in Tulsa. I'm beyond grateful for the work he has done for me. He gives it to you straight and doesn't sugar coat what's going on. He knows just what to say to calm you down if you're freaking out. He explains everything in detail and in a way that you will understand it, not like most other attorneys. If I could honestly give more then just 5 stars I would in a heart beat. I couldn't have picked anyone better for my case. Great lawyer. I couldn't have picked anyone better for my case. I definitely recommend him. I got myself in a bad situation and Lee helped and talked me through it. Lee Berlin is an awesome and fantastic lawyer. I got myself in a bad situation and Lee helped and talked me through it. If i could give him more than five stars I would. I would honestly recommend him to anyone who asked and needed legal advice. He's a very honest man, he does not sugar coat things. His prices are also fair. He totally deserves more than five stars. I got exactly what I wanted even the judge told me. I can't be thankful enough that I hired Mr. Berlin. I got involved in a really bad situation that impacted me and my family really bad. When I first met Lee he agreed to see me the same day, he insured me to do his best and got working on my case immediately. I got exactly what i wanted even the judge told me "Do you know that your attorney got you an excellent deal" Mr. Berlin thank you so much for all your time, patience and professionalism.